Retired military officers are profiting from private security contracts around some of Pakistan's most contested regions, stoking new fears of nepotism and corruption. In July 2016, the Pakistani senate was informed that the armed forces run over 50 commercial entities worth over $20 billion. Ranging from petrol pumps to huge industrial plants, banks, bakeries, schools and universities, hosiery factories, milk dairies, stud farms, and cement plants, the military has a finger in each pie and stands today as the biggest conglomerate of all business in Pakistan. In 2015, the U.S. Congress decided it was time to take a public accounting of the U.S. government’s war against al-Qaeda. In that year’s National Defense Authorization Act, Congress mandated: The Secretary of Defense, in coordination with the Secretary of State and the Director of National Intelligence, shall provide for the conduct of an independent assessment of the effectiveness of the United States’ efforts to disrupt, dismantle, and defeat Al-Qaeda … since September 11, 2001. At least 305 civilians were killed on November 24 when ISIS bombed a Sufi mosque in the Egyptian Sinai village of al-Rawdah and opened fire on the panicked crowd. On Friday, November 24, some 30 gunmen carrying the Islamic State flag bombed and stormed a Sufi mosque in Egypt's North Sinai, about 125 miles northeast of Cairo. They managed to massacre at least 305 people, 27 of whom were children. "The scene was horrific," said Ibrahim Sheteewi, an eyewitness. "The bodies were scattered on the ground outside the mosque. I hope God punishes them for this." Units of Strategic Missile Forces control centres, crews of nuclear missile submarines of the Northern and Pacific Fleets as well as long-range strategic bombers of the Russian Aerospace Forces carried out training missions. A group of experts warned the military alliance “risks falling behind the pace of political change and technological developments that could alter the character of warfare”. The panel, put together by security NGO Globsec, set out a raft of recommendations that leaders should adopt by the organisation’s 70th anniversary summit in 2019. They include enhancing security forces and building relationships with influential rising powers like the Chinese. It warned: “To maintain its credibility as a defensive alliance NATO must embark on a more far-reaching process of adaptation. “NATO must ensure it has the capacity to fight a future war if it is to deter and prevent such a war. Energy has played, and will continue to play, a pivotal role in the economic development of the world’s major emerging economies and other developing countries. Increasingly, these countries will serve as the centers of energy-demand growth and energy investments. As such, the decisions they make about how to develop their energy sectors will be important to not only their own development but also in determining future levels of energy consumption, fuel choices, patterns of trade, and other factors. These countries are influenced not only by their own domestic priorities, policies, and regulations, but also by the international investor and donor communities. Several major shifts are taking place in the energy and development landscapes that warrant increased attention from policymakers, academia, and the private sector. WASHINGTON — In September, Russia and Belarus ran the latest version of the biannual Zapad training exercise. While training against an incursion from the fictional nation of Veshnoriya, the exercise was widely viewed as practice against NATO allies, with particular concern from Poland, Latvia, Lithuania and Estonia. 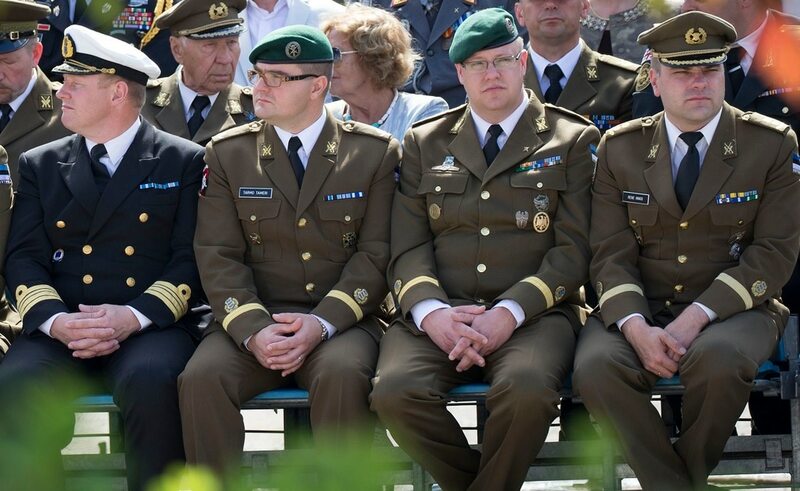 Among those closely watching Zapad was Col. Kaupo Rosin, Estonia’s chief of military intelligence. During a recent visit to Washington, Rosin sat down with Defense News to discuss lessons learned from Zapad and what Russia may do next. When the Obama administration led a 2011 NATO military intervention on behalf of rebels seeking to overthrow Libyan dictator Muammar el-Qaddafi, there was considerable optimism that the move would produce a much better country. Although U.S. officials and their media cheerleaders acknowledged that significant challenges remained for a post-Qaddafi Libya, they argued that the outcome could scarcely be worse than the oppressive status quo. Events over the past six years have proven their assumptions spectacularly wrong. Libya is now a cauldron of turmoil and Islamic radicalism. For nearly seven decades, NATO has created and strengthened the bonds of the transatlantic relationship, generating a sense of shared identity of the West. It is the essential organization for defense and security for 66 percent of Europeans and 62 percent of Americans. Views of NATO have generally improved over the years. After the fall of communism in Europe, the objectives and priorities of NATO have changed and multiplied in many areas. However, one legacy from the Cold War era still remains, the imbalance in burden sharing among allies. Is the US behind in cyber-enabled info operations? 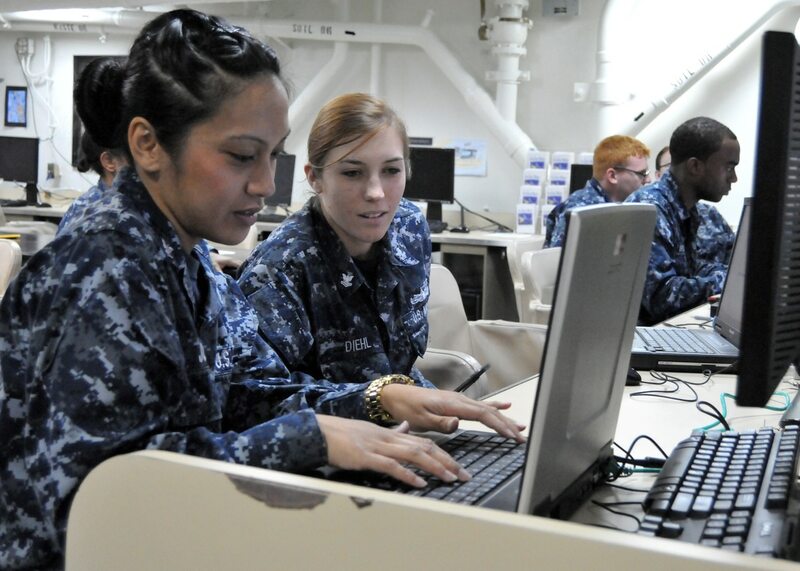 Information Systems Technician 3rd Class Jacquelyn Jose, left and Information Systems Technician 2nd Class Aubrey Diehl, assigned to the amphibious assault ship USS Boxer (LHD 4) set up administrator accounts on a virtual server during a network training course provided by Space and Naval Warfare Systems Command (SPAWAR). Within the broader realm of cyberwarfare, the prospect of data and information war is becoming much more prevalent. Here’s a chilling fact: At the height of the Catalan separatist crisis, analysis of more than 5 million messages about Catalonia posted on social networks between Sept. 29 and Oct. 5, shows that only 3 percent come from real profiles outside the Russian and Venezuelan cybernetworks. These are the conclusions of a report prepared by Javier Lesaca, visiting scholar at the School of Media and Public Affairs at George Washington University. WASHINGTON, DC — On Tuesday, the U.S. Federal Communications Commission (FCC) released its plans to revoke net neutrality — a series of policies that require Internet service providers (ISP) to treat all Internet traffic equally. Without those policies, an ISP like­ Comcast, Verizon, or AT&T will be able to charge consumers more for access to certain websites and charge websites for preferred access to consumers; make some sites faster or slower, potentially privileging, for example, their own streaming services over Netflix and YouTube; and block access to some sites altogether. It will also eliminate FCC authority over data privacy. In essence, it will give telecommunications companies the power to control how Americans use the Internet, undermining Washington's claim that its technology policies are geared toward protecting entrepreneurship, defending freedom of speech, and prioritizing consumer choice. The Lockheed Martin MDC2 exercise was designed to look at the challenges facing the military as they try to create an “integrated tasking order” similar to a traditional Air Tasking Order. An ATO assigns missions and schedules sorties for every aircraft in a theater, the integrated tasking order would assign tasks to all space and cyber forces as well. Building a weapons system is complex but there can be even more daunting challenges when you’re in the early stages of designing and building a command and control system such as MDC2. Culture, training, language and even nationality can pose challenges as large as — or even bigger than — the technology. Is the U.S. Army on Verge of Creating 'Super Soldiers'? · The pre-attack phase is stealth, the organization of a cyber attack present low risks respect conventional terrorist attacks. · The use of a zero-day vulnerability provides a real advantage to the attackers that minimize the risks of failure of operations and maximize the efficiency of the cyber weapon. Zero-day exploits could be acquired in the criminal underground and could be used in targeted attacks. 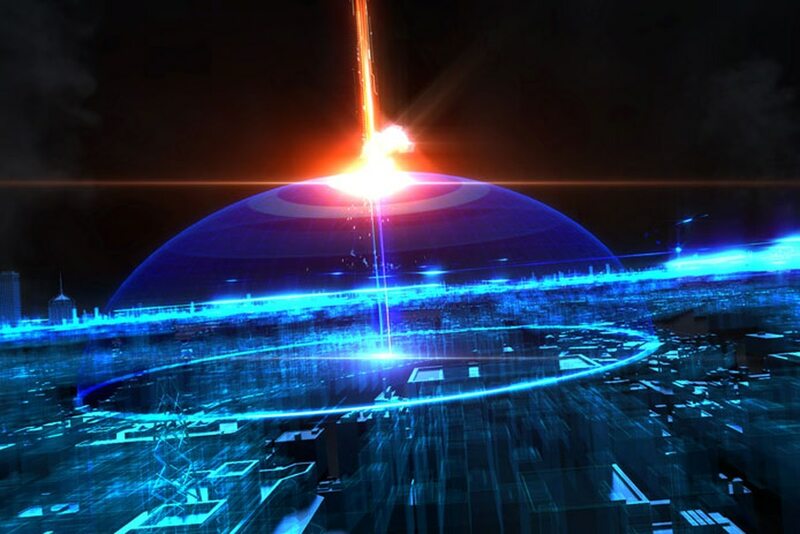 · The costs of a cyber weapon are very cheap compared to the one related a conventional weapon (explosive, weapons, vehicles for the commandos, etc.). · The choice of cyber weapon allows the terrorists to remain under the radar until the attacks. · Cyber weapon could have similar effects of a terrorist attack. The list is very long and includes almost every strategic infrastructure of a country such as Industrial control systems, communications networks, and defense systems. Despite groups of terrorists haven’t the time and the knowledge necessary for the design of a new cyber weapon, there is the concrete risk that threat actors in the wild can conduct a reverse engineering of the code of other nation-state malware circulating over the Internet. The ISIS is trying to recruit hackers and experts to involve them in the hacking campaigns. Social media is not the cause of violent extremism, but a powerful amplifier and accelerant. Digital platforms and increased access to smart phones and internet connectivity help facilitate radicalization and recruitment. Violent extremists’ exploitation of digital platforms allows would-be terrorists to seek inspiration and information online—and rally around a terrorist group as a brand, an idea, or a methodology—without ever leaving their homes. The widespread use of social media has also made violent extremists’ plans more difficult to disrupt. Security agencies have to track a much larger number of potential plotters, giving terrorists more space to plan large, complex operations against a higher background level of activity. • As a way to share operational and tactical information, such as bomb recipes, weapon maintenance and use, tactical shooting, etc. • As a gateway to extremist sites and other online radical content by linking on Facebook group pages and in discussion forums. The technology firms have faced increasing pressure from governments across the globe to stop the spread of extremist propaganda. Last year, White House officials met with Apple, Facebook, Twitter and Microsoft to discuss the subject. The British prime minister, Theresa May, has recently renewed her campaign against the technology companies with a crackdown meant to punish platforms that fail to take sufficient action against terrorist propaganda. At a recent bilateral meeting in Paris, May and French president Emmanuel Macron said they would explore new legal liabilities for tech companies that don’t remove inflammatory content, including possible fines. While governments have urged companies like Facebook to do more, the social network has also faced backlash for ethically questionable censorship of non-terrorist content under the guise of countering propaganda. The tech firms have long struggled to balance their missions of supporting free speech with the need to remove and prevent the spread of terrorist content. The companies have faced intense scrutiny over the way terrorist groups have used the site for recruitment and for spreading hateful and violent messages. On Jun 25, 2017 Facebook, Microsoft, YouTube and Twitter collectively announced a new partnership aimed at reducing the accessibility of internet services to terrorists. The new Global Internet Forum to Counter Terrorism adds structure to existing efforts by the companies to target and remove from major web platforms recruiting materials for terror groups. Together, the four tech leaders say they will collaborate on engineering solutions to the problem, sharing content classification techniques and effective reporting methods for users. Each company also will contribute to both technical and policy research and share best practices for counterspeech initiatives. As part of the new forum, the companies said they would share best practices regarding content detection and classification techniques using machine learning” and “define standard transparency reporting methods for terrorist content removals”. Back in December of 2016, the same four companies announced the creation of a shared industry hash database. By sharing hashes with each other, the group was able to collectively identify terror accounts without each having to do the time- and resource-intensive legwork independently. This new organization creates more formal bureaucracy for improving that database. Facebook, Microsoft, YouTube and Twitter will be teaching smaller companies and organizations to follow in their footsteps to adopt their own proactive plans for combating terror. A portion of this training will cover key strategies for executing counterspeech programs like YouTube’s Creators for Change and Facebook’s P2P and OCCI. Privacy vs Security. Law enforcement and security agencies have claimed that encrypted platforms built for commercial purposes to safeguard privacy—where only the sender and receiver hold the keys and devices to decipher the message—are a gift to terrorists and criminals to help them communicate in a way that puts them beyond the law’s reach. In January an ISIL follower provided would-be fighters with a list of what he determined were the safest encrypted communications systems. Soon after the list was published, ISIL started moving official communications from Twitter to Telegram. Both in the US and in the UK there has been a push for technology companies to either ban encryption on the grounds that we’re paying too high a price in terms of security, or at the very least request that companies like Apple, Google and Facebook build ‘backdoors’ that allow law enforcement access into their encrypted tools. When it comes to privacy and security, we need to find the right balance in not allowing new encryption technologies to obstruct our counterterrorism efforts. We need secure encrypted systems for commerce, government and the protection of personal information (our digital identity). Banks and telcos are using those products to safeguard our data. Deliberately weakening encryption solutions would arguably weaken key infrastructure, with the ultimate beneficiaries being criminals, cyber activists and rival nation states. A cooperative solution with our police and security agencies working with relevant companies to identify the problems would be better than trying to introduce laws to restrict encryption. Indeed, there’s no guarantee that by banning the use of encryption solutions, as recently proposed in the UK by David Cameron, can be effective. Users and companies might migrate to other countries, solutions, products or servers. Big data plays a vital role in the war on terror. In order to fight the enemy, it is critical to get an in depth understanding of that enemy, how they operate, what technology they use. Nothing gives us better insights than big data. The data can be used to get an understanding of backgrounds, motives, modus operandi, methods of communication. Once these elements are understood, the information can be leveraged to learn about terrorist networks; who finances them, who supplies them, who supports them and who are the informants. Big data can also be used to establish patterns and make predictions on which population groups or what type of person would be most likely to join a terrorist organisation. In a project, big data was used to scrutinise and analyse social media such as Facebook and Twitter in order to locate the origins of supporters of terrorist organisation ISIS. Over a period of three months, researchers monitored and analysed three million tweets. They managed to pinpoint important characteristics and patterns among tweets that showed support for ISIS and terrorism, as well as those who opposed it. Using these findings, the researchers created algorithms that were able to group users as pro- or anti-ISIS with an accuracy of nearly 90 percent. It is clear to see the value of being able to identify which people would be most likely to join ISIS as this could help limit the proliferation of extremist groups. Surveillance data from drones gathered in areas where suspicious activity is taking place can also provide valuable information, especially when this real-time information is combined with other data sources. Information like this can help establish connections between people and events and identify the location of terrorists and even make predictions of the where they may move to in the future. Toy-sized battle robots with grenades and assault rifles. At the World Robot Conference in Beijing, China recently unveiled toy-sized battle robots with grenades and assault rifles. These robots have been designed in three versions: an attacker robot – armed with grenade launchers and rifles that minimise recoil – a reconnaissance robot capable of detecting hazardous gases, and a bomb disposal robot. The reconnaissance robot is apparently designed to be able to fit into a soldier’s backpack. Another robot used in the war against terrorism is the PackBot – a machine that locates and diffuses bombs. The PackBot will eventually carry out complex tasks without any human interference and will be very effective in detecting terrorists and explosives. PackBot can gather information from devices such as streetlights, bus shelters and sensors and combine it with its own data to make decisions. Various countries are developing autonomous robots that are able to eliminate terrorists and free hostages. These bots will be outfitted with biometric recognition technology and connect with sources that supply image data and location information to help identify potential terrorists. Dfuze and Predictify Me – predicting the unpredictable. The use of prediction software in the fight against terrorism is also referred to as ‘predictive policing’. 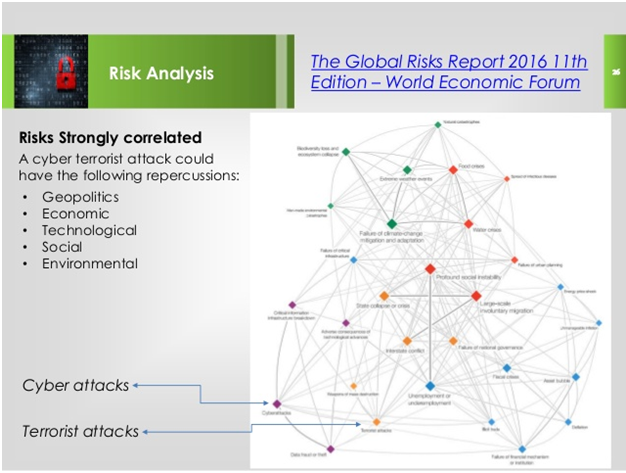 This form of counterterrorism has been on the increase and the ISS (Intelligent Software Solutions) behavioural analysis tool Dfuze is already used in over forty countries. Dfuze was used at the 2012 Olympics in London to pinpoint high risk areas to enable police forces to increase security presence. The software was also used to investigate the Boston bombings in 2013. The Dfuze system is a database which holds information on all terrorist attacks that have ever taken place. Governments can access this data to analyse previous attacks and share information, leading to more efficient methods of communication between nations. With the Dfuze system, specialists are able to establish and analyse trends and patterns, future attack hotspots, the types of explosives, modus operandi and help them predict, prepare for or even prevent any future terrorist attacks. In the past, this type of work was done by analysts trawling through mountains of information, initially in paper files and later on computers. Another predictive solution, launched in 2014, is Predictify Me. The technology is simple to deploy, can help predict an impending terrorist attack and secure areas against it. Predictify Me uses 200 indicators, such as public holidays, the weather, attacks in nearby countries, sports or other events and even video releases on social media to predict whether and when a terrorist attack is likely to happen. Predictify Me have indicated that it is able to predict an attack within three days with an accuracy of over 70 percent. With the Internet of Things, every device has an IP address. With more and more devices connecting to not only the Internet but also to each other, the Internet of Things enables increased convenience, efficiency and energy conservation. With internet connectivity moving away from the traditional laptops, tablets and smartphones and migrating toward wearables and household devices such as fridges and washing machines, the IoT can also easily be used for monitoring, location tracking, identification, surveillance and gaining access to networks. Every device will have an IP address and security experts have indicated that surveillance services will able to intercept signals of networked devices in much the same way as they intercept cell phone signals. Information from speeches, satellites, videos and news is all collected and used to monitor and analyse activities, enabling intelligence services to close in on terrorists. New colour-changing sensors can detect multiple explosives within seconds. In December 2015, scientists developed a new colour-changing sensor that is able to identify and quantify multiple explosives such as DNT, PETN, tetryl, RDX and TNT within ten seconds. The fluorescent sensor gives out information about the type of explosive and how much of it is present in a sample. PETN and RDX for example, have been used in terror plots because they are hard to detect by sniffer dogs. The colour-changing sensor is made from light-emitting nanomaterials or ‘quantum dots’ to which receptors that target the explosive are attached. Each explosive that binds to the quantum dot emits a different colour. These are then analysed in order to generate a unique ‘fingerprint’ for each compound. This makes it possible to detect multiple explosives with one single test. Could the internet eventually be used to cause physical attacks? So far, jihadists and others practicing "cyberterrorism" have mainly cracked the passwords for online accounts to collect information for target lists. These efforts have caused a great deal of fear, but not damage or death.But this is something that's coming. The United States and Israel reportedly caused actual damage to the Iranian nuclear program through malware such as Stuxnet. Russia has conducted cyberattacks against physical targets such as the Ukrainian power grid. With Stuxnet being reverse engineered by hackers, and other National Security Agency hacker tools made available through groups like Wikileaks, it won't be long before jihadist or other terrorist hackers are able to cause real world damage by simply accessing the internet. Other technological tools that can be used for pre-operational surveillance, propaganda purposes and attacks have become prominent as well. For jihadist groups in Iraq and Syria, it's small commercially available drones. Much has been made of the threat of using drones to launch attacks, but to date, drone strikes by the Islamic State have used altered conventional munitions such as 40mm grenades or military-grade explosives placed in locally manufactured munitions. Hezbollah likewise has used drones in attacks, but they similarly have relied on military ordnance provided by Iran. Consequently, even if militants elsewhere attempt to use drones, it will be difficult for militants to reproduce these attacks outside of active war zones. They simply don't have the weaponry. Such drone strikes in domestic settings will remain limited in their capability for now. As technology advances, terrorists and counterterrorism forces will continue to use it to their advantage. It just depends on who picks it up from the table first. Research and Development Trends. Most of the cutting-edge research in related areas, particularly with regard to information technology and biotechnology, is in the private sector where development pro­grams are largely driven by potential markets and the profits to be made in the security sector seem to pale in comparison with other commercial opportunities. This challenge can be addressed by mak­ing the counterterrorism community a more attrac­tive customer for the private sector. A significant next step would be initiating a serious dialogue to determine what a future inter­national counterterrorism security technology development regime might look like. Barriers to Innovation. Even if private research and development can be better teamed with gov­ernment efforts and focused on the terrorism chal­lenges of the 21st century, the traditional barriers to innovation in law enforcement technologies will remain. These challenges include four areas. Cost. The expense of new technologies includes both the cost of procuring a technol­ogy and the opportunity cost of adopting that technology as compared to other uses to which resources might be put. Technology Risk. This includes the ever-present risk that "big bets" will fail. The tech­nology may not perform as expected or ade­quately address the tasks for which it was adopted. Human Factors. New counterterrorism tech­nologies can face a plethora of obstacles that have nothing to do with fiscal costs or technical specifications. For example, data mining and biometrics have raised an array of concerns about the protection of civil liberties and safe­guarding of proprietary commercial informa­tion. Non-lethal weapons face legal barriers. Unanticipated Costs. Any new technology will bring unintended consequences. The introduction of nanotechnologies, for example, has raised concerns about the potential conse­quences of unintentionally introducing new compounds into the environment. New tech­nologies can also bring unexpected liabilities and adverse public reactions. The terrorists are proving more and more adept at using sophisticated technology. The terrorist threat against the free world is seri­ous and enduring. We need to stay one step ahead and keep developing new, improved technology. We need to jointly develop the means and the technologies needed to meet this threat. The obstacles to creating an arsenal of counter-terrorism technologies that are practical and afford­able and overmatch the threat of 21st century ter­rorism are daunting. Creating a vision of these future technologies, implementing initiatives that broaden the market and make it more predictable and dependable, and developing policies that will help to overcome the barriers to innovation are essential steps to harnessing technology to the future needs of law enforcement. Individuals and particular situations often dramatically illustrate processes in the India Pakistan terrain. The cases of Dawood Ibrahim and Masood Azhar chronicle the troubled 1990s and the early years of this century. 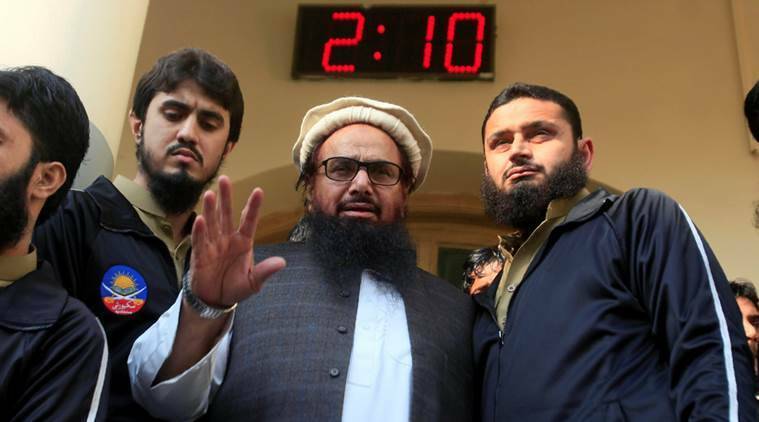 Since the Mumbai attack of 2008 Hafiz Saeed has become a metaphor for all the lows in India-Pakistan relations. His release from preventive custody just two days before the ninth anniversary of those fateful days of November 2008 symbolizes the structural limits within which the India- Pakistan interface operates. Saudi Arabia appears to be on a warpath across the Middle East. The Saudi-orchestrated resignation of Lebanese Prime Minister Saad Hariri, and Saudi officials’ bellicose rhetoric after the launch of a ballistic missile targeting Riyadh from Yemen, appear to herald a new period of assertiveness against Iranian interests across the Middle East.Crown Prince Mohammed bin Salman’s sudden moves on a variety of fronts may superficially have the feel of Michael Corleone’s swift and simultaneous strikes at his family’s enemies in the closing frames of The Godfather. Unlike in the film, however, the credits are not about to roll. Rather, these are the opening moves in an ongoing contest — and it is far from clear that the 32-year-old crown prince has found a formula to reverse Iran’s advantage. China’s military modernisation remains a key concern for the U.S. and its allies. Crucial in that regard has been China’s development of forces geared towards preventing uncontested access to its air and maritime approaches by potential adversaries. Such ‘anti-access and area denial’ (A2/AD) capabilities are designed either to prevent an adversary’s access to a particular region (anti-access) or to contest its freedom of movement within that theatre (area denial). This was a case in point. Chancellor Merkel’s attempts to build a coalition government fell apart. Eurosceptic liberals and green ultras could not agree a programme for government with her Christian Democrats. The British right gloated at the prospect: this was the moment to exact better terms in the Brexit negotiations from a mortally wounded Germany now suddenly brought to earth. It was thinking far removed from any reality. Germany is neither politically nor economically mortally wounded. Yes, there is a major political crisis following a hung election, but Germany will find a way through, rather more satisfactorily than stuffing a tiny minority party with a billion-pound bribe, as the Tories did with the Democratic Unionists. Its political system requires its principal parties to keep on talking to each other if none can command an overall parliamentary majority; they have their ideologies, but tempered by the necessity of dialogue to form a potential programme for government. A resolution will be found, or another election called, with the electorate more keenly aware of the choices they are making. It is democracy by grownups. Chinese President Xi Jinping has strengthened his domestic authority and offered an expansive vision for his country’s global role. 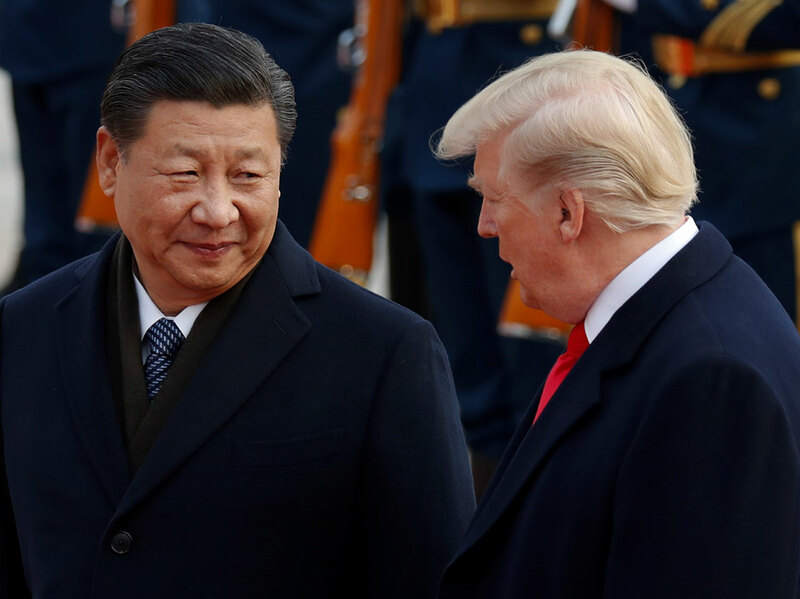 To address the rise of China, the United States must think beyond “America first”. While a coherent US foreign policy in the Asia-Pacific region is yet to take shape, the European Union and China found common ground on three key issues at the 13th Asia-Europe Foreign Ministers’ Meeting, which concluded in Naypyidaw on Tuesday. Reiterating that multilateralism, peaceful resolution of conflicts and diplomacy are the cornerstones of their foreign conduct, the European bloc and the Asian giant focused their attention on Myanmar, North Korea and Iran. EU foreign policy chief Federica Mogherini and Chinese Foreign Minister Wang Yi met ahead of the meeting’s plenary session, with the Rohingya crisis topping their agenda. More than 600,000 ethnic Rohingya Muslims have fled from Myanmar’s Rakhine state into Bangladesh since last August, when the local military launched a counterinsurgency operation against the Arakan Rohingya Salvation Army. “The overseas troops will engage in regular military exercises just like troops serving [in China]. But their practice should soon have a different focus, rather than basic shooting training, because their mission in Djibouti is to protect China’s interests in Africa, as well as peacekeeping,” Zhou said. China’s overseas military expansion was the focus of a July Pentagon report, which said that Beijing may soon seek to establish a network of similar facilities around the world. A Saudi-led Muslim military coalition, commanded by a celebrated former Pakistan army chief, will be officially launched on Sunday when Riyadh hosts defense ministers of the participating nations at its inaugural meeting. 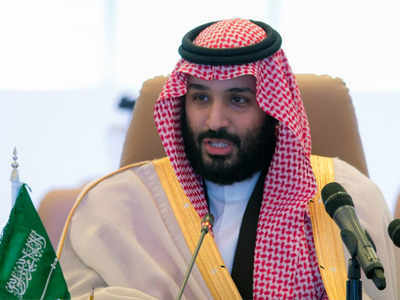 Saudi Crown Prince Mohammed bin Salman, Defense Minister of Saudi Arabia, will open the meeting of the Islamic Military Counter Terrorism Coalition or IMCTC, said an official statement issued on the eve of the event. Saudi Arabia's powerful crown prince vowed to "pursue terrorists until they are wiped from the face of the earth" as officials from 40 Muslim countries gathered Sunday in the first meeting of an Islamic counter-terrorism alliance. "In past years, terrorism has been functioning in all of our countries ... with no coordination" among national authorities, Prince Mohammed bin Salman+ , who is also the Saudi defence minister, said in his keynote speech at the gathering in Riyadh. Is the U.S. serious about countering Russia’s information war on democracies? Long before the 2016 presidential elections in the United States, Russia was engaged in an effort to subvert European democracies through the tactical deployment of “weaponized information.” A seminal 2014 report by Peter Pomerantsev and Michael Weiss (published by the New York-based Institute of Modern Russia) accurately described how the Kremlin sought “not to convince or persuade, but to keep the viewer hooked and distracted, passive and paranoid, rather than agitated to action.” By exploiting existing societal fissures—race, class, ethnicity, immigration status, etc.—the Kremlin has successfully created political instability in Germany, Estonia, France, Ukraine, the Czech Republic, and elsewhere. Largely a preoccupation of hobbyists and experimenting companies, the vehicles are beginning to become a menace on the battlefield, where their benign commercial capabilities have been transformed into lethal weapons and intelligence tools. Instead of delivering packages, some have been configured to drop explosives. Instead of inspecting telecommunications towers, others train their cameras to monitor troops and pick targets. Instead of spraying crops, they could spread toxic gas, commanders worry. Military strategists envision the day when they will be deployed in robot armies capable of swarming defenses in kamikaze raids.